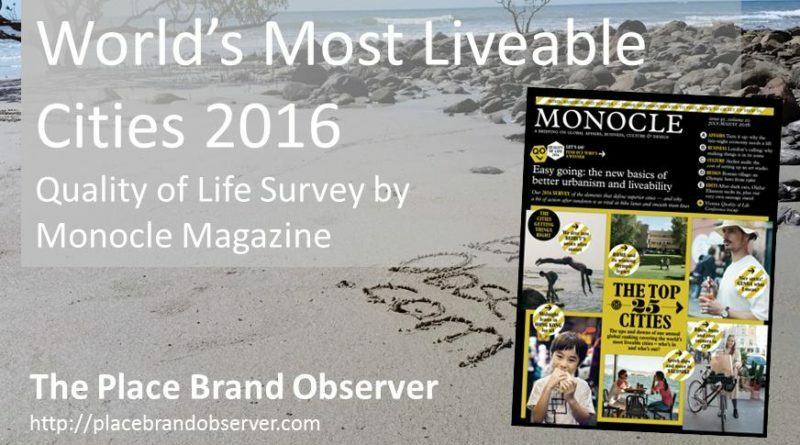 Monocle Quality of Life City Ranking 2016: Recently at The Place Brand Observer, we have started looking at worldwide city rankings – lists created by consultancies measuring city livability, sustainability, and understanding how well they are utilizing their assets in branding efforts. As the research continues, some of us are starting to wonder if the Big Three (Paris, London, New York) are actually just world favorites and the standard by which we judge all other cities. This is where Monocle’s Quality of Life Survey on the Top 25 Cities to live gets interesting. None of these high-performers dominate the top three, and in fact, they are not even included on the list. London is actually taking note – wondering how, in spite of all the city’s efforts to attract the tech sector and appease visitors, it has not made an appearance on Monocle’s list. What’s particularly beautiful about the 2016 Monocle list is that it has a clear definition of what it seeks to rate. Here, ‘Quality of Life’ is calculated in a way that is less concerned with per capita GDP and more interested in how easily one can directly travel to international destinations. With its’ ‘nocturnal metrics,’ noting how late clubs stay open, Monocle nods to the fact that a high quality of life is a 24-hour affair and may not necessarily coincide with city features that are traditionally attractive to corporations. Turning to look at the trends, we notice that cities with a rising cost of living (such as Stockholm and Vancouver), have lost some clout and have dropped down in the list since 2015. The ranking has also made a point of recognizing cities where leadership (mayoral positions) appear to be improving the quality of life for local residents (see Barcelona and Fukuoka) through creative policy and investment in public infrastructure. Copenhagen is recognized as a city that emphasizes quality of life by providing a space for residents to “cycle on clean roads and swim in clean water.” Monocle also uses this list as an opportunity to make suggestions for improvement in cities that are otherwise excelling per Monocle metrics. Sydney, for example, can “do no wrong,” but appears to have a connectivity issue and could benefit from adding a few flight routes to its airport schedule. Tokyo appears to be the clear winner for the second year in a row (rising from its’ #2 position in 2014). Defined as “master class” in pedestrian-friendly living while maintaining its traditional values, the city has consistently carved out a place for itself at the top.